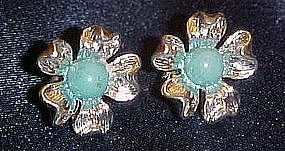 Pretty little silver tone earrings are flower shaped with a faux turquoise center bead. Measures 3/4" in diameter and they are in very nice condition. Clip backs.